When we put alots of mods (with mobs) this mods (im sure that is this mod) make Glitch the aniamtions as f*** (srry for this word but it was neccesery) Could you Correct this? I had this issue as well, with the setting "Taylor's algorithm". Set it back to Riven's algorithm immediately when you reopen Minecraft AT THE MENU SCREEN. Then restart Minecraft (it'll ask you if you want to, click yes). Then you should be fine. No idea what causes this, but @Guichaguri, if you can fix this, please do. It bugs out textures, animations, practically everything visual. Any chance it should be compatible with Foamfix? Just so I know. For some reason the mod won't let me install it? But it creates the .txt file that always appears when it should be installed, and it was dated when I had clicked the install button, yet the installation did not start. It's strange because this worked perfectly before, but i'm not sure if it actually happened and there was something I needed to do as a fix. If there is, please let me know! I love the mod! I did a side-by-side for you. LOL this is not how you compare them. Your fps is fluctuating wildly, you have 2 minecrafts open at the same time etc. Zero reliability here to get an accurate result of meaningful difference. I assume this is pointless for ryzen systems because the algorithms were made pre ryzen and the only one faster than vanilla is glitchy and doesnt work properly on ryzen. What I mean: All of the algorithms are exactly the same speed except taylors and javas. Taylors is consistently 10ms faster than the others while javas is about 3 times slower. The reason it doesnt matter is because Taylors breaks the game. Is it only for the client or has it some improvements for the server too? I don't know if these were there when you looked, but there are notes under each improvement listed that clarify which side is improved. when i put this into my mods folder and it doesn't show the mod in the mod library in minecraft and i clicked installation for minecraft forge on this website and it said forge is missing a feature if it won't show up so could somebody show me how do i get the missing feature please? If your forge installation is ever missing any libraries it needs, simply re-install forge for the correct version and all should be fine. If not, delete the broken version of forge in your versions folder (%appdata%/.minecraft/versions) and then try installing again. Also, try downloading the mod again. Excuse me, I am a player from China. I think your mod is very good, I hope to be able to transfer it to MCBBS (www.mcbbs.net), I will mark your information. But since China can't access some foreign websites, I need to upload it to China's storage websites. Of course, I won't receive any income. I hope you can agree. Hey when I use the benchmark feature I get negative values and everytime I press "benchmark again" They're still there, and the program keeps giving a different algorithm that's best for me. Is this normal? Sorry, I'm kind of new to all this stuff. 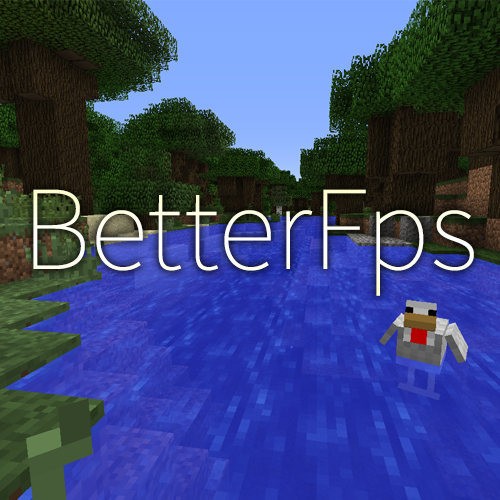 Can I use your mod in the modpack FTB Revelation clientside to improve fps and hopefully get rid of the lags?